Monica was taking pictures for the Classic Workboat Show at South Lake Union and took a couple of pictures of myself and some others on the Virginia V. So turnabout is fair play I thought, so I took four pictures of her, she had this great big smile in three of the four pictures. Sorry about the crane growing out of the side of her head, forgot to look behind her. 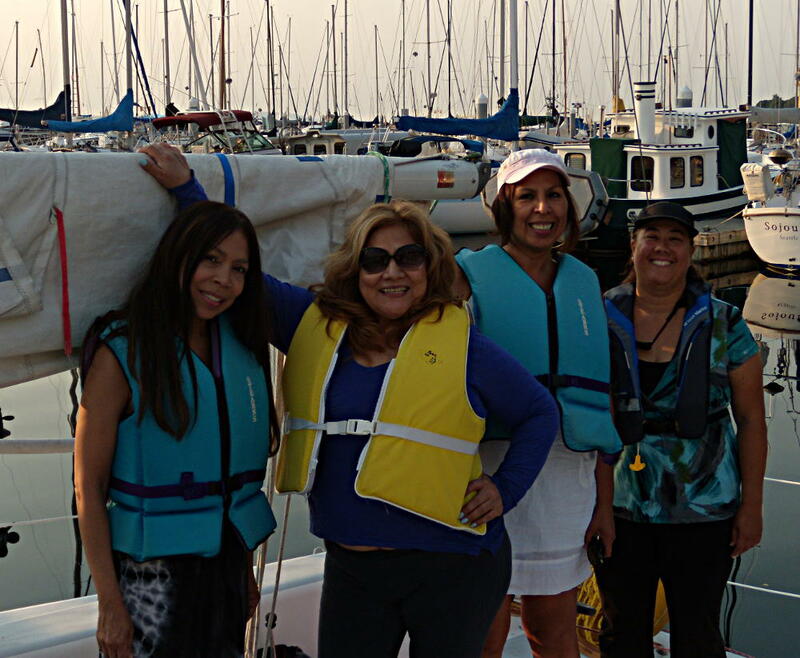 Here are a few pictures from the open water session of the kayak class I am taking. Was at Lake Sammamish and was an open water session. Strap us in a kayak then the kayak is flipped upside down and we needed to undo the spray skirt and get out of the kayak while it is upside down, not a natural act at all. Then get back into the kayak. At the end I think the instructors were selling tickets to the other instructors to watch me sort of topple out of the kayak at the beach. Not very graceful at all. 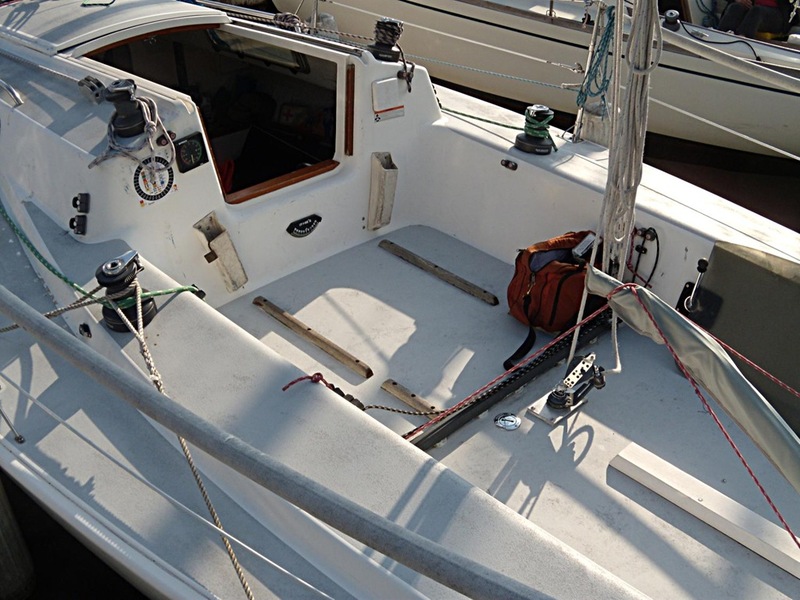 Nice day – sun – wind a bit light but my boat moves nice in light wind. Nice group and nice company. 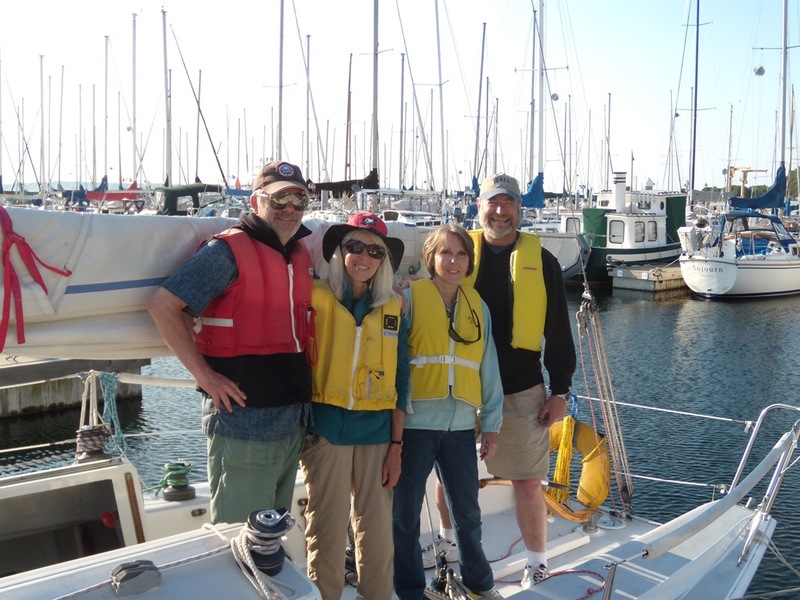 Sailed out around West Point and into Elliot Bay until the wind go light, then ghosted out and back around Shilshole. Watched part of PSSC racing. Karina had sailed on my boat some years back, remembered most things about it except the low headroom for her below. But the boat was as nice to sail as she remembered it so all was not lost. No wind but nice food. 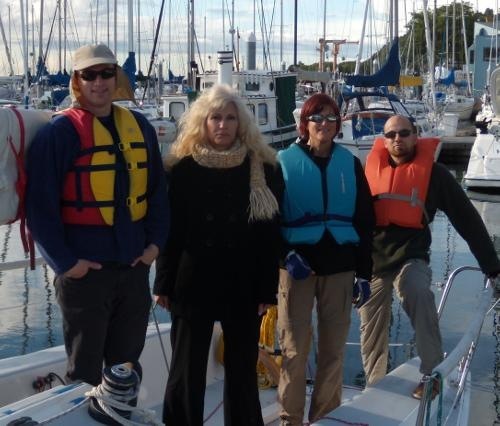 Went off Shilshole Marina and raised the main to make us a sailboat and to make the crew think we were really sailing. Maybe two knots of wind for a couple of minutes. Kami came with pages of questions at the end of the sail on why did I do things the way I did or why did other boats do things differently. I think I made sense with most of my answers. Sorry the pictures are not so good this trip. Wind was up a bit and the sound lumpy, reefed at the dock. Still had a bit more power than what I wanted for beginners, but did some tacks and jibes and everyone caught on quickly. Bree did a nice job driving the boat when we dropped the sails. 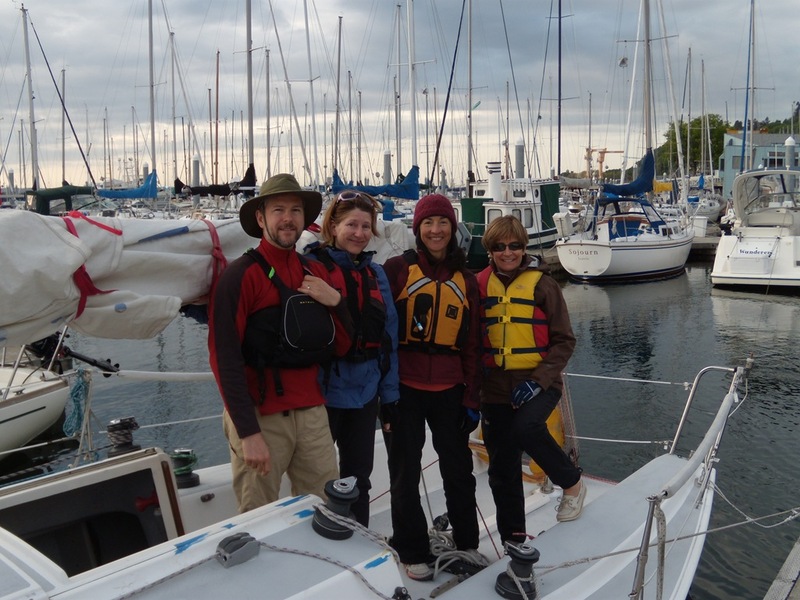 Started out light – then filled in from the north in the afternoon and we got some good sailing in. Kari had not been on a small boat nor sailing before. 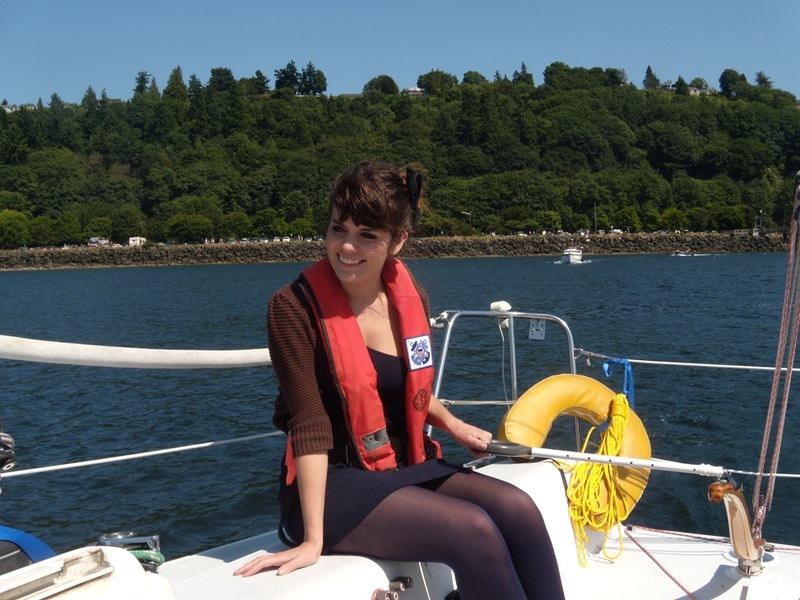 She is thinking about a career in the Coast Guard so we got her out for some boat training and sail training. Took a few practice throws but she got the catch a cleat thing down – she never quite looked comfortable stepping off the boat at the shrouds, just needs a bit more practice probably. The throw a long dock line was like throwing a life ring that she had trained as. 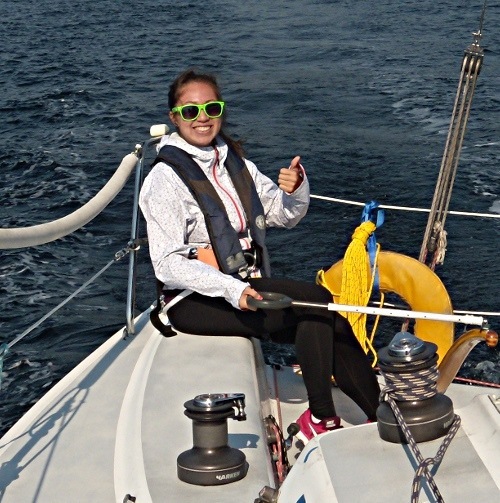 For some reason she did not connect the “training day” with driving the boat so she was a bit surprised to find herself driving the boat, she had not expected to drive the boat the first trip out. She did a good job. There was sail boat race going on that we got to watch a bit. Sunny weather but light wind. The crew also received a demo and lesson on how to mark a halyard or whip the end of a double braid line using Mike’s Quick Rope Whipping. West Point never got over 5 knots, we sailed up to West Point then had a leisurely picnic downwind back to the marina. Carol had two friends in from London & France. 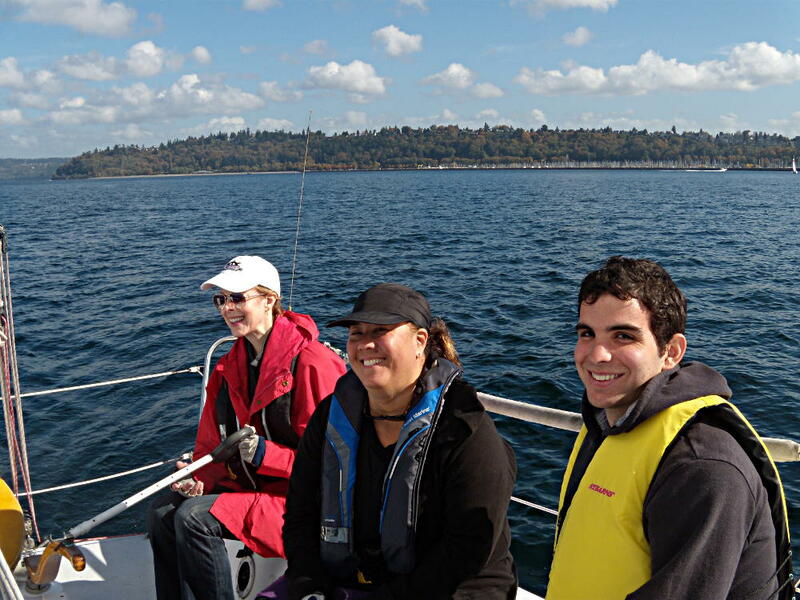 What is more Seattle than sailing? 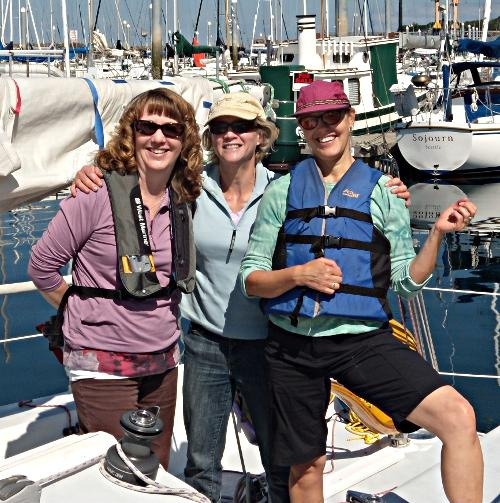 Kristine had been on a sailboat before but had never driven. 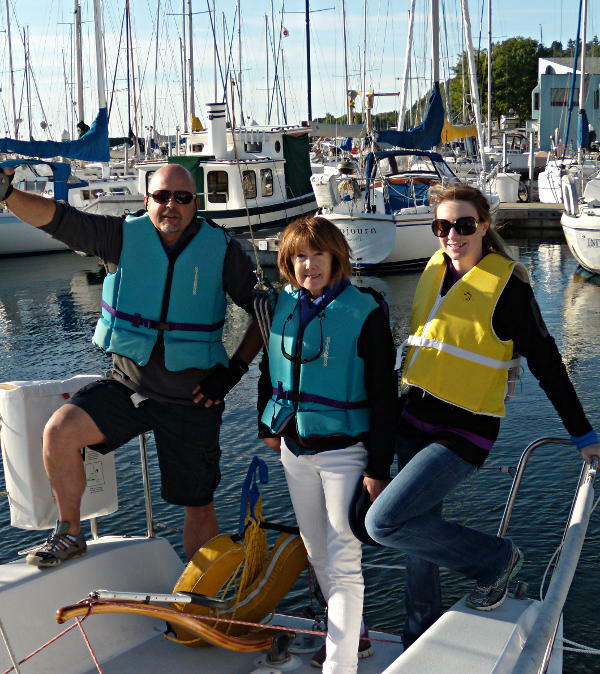 Kristine and Alan’s son had taken a sailing class recently, she now has some real sailing experience to share with her son. Lynn has sailed with the Mountaineers before but not for a while. The wind started a bit light but filled in nicely from the north, not much for waves, lots of sunshine. 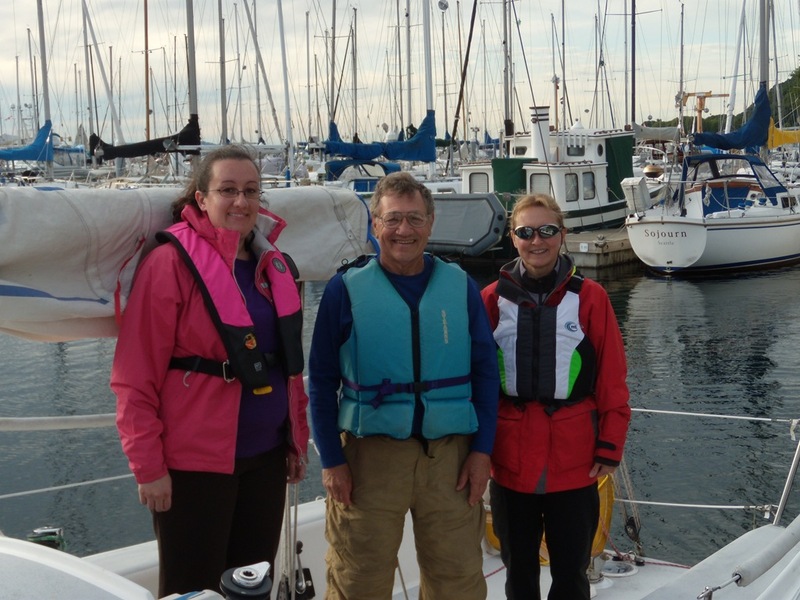 Not much wind – went out and sailed for a while then came back to the dock for a picnic. 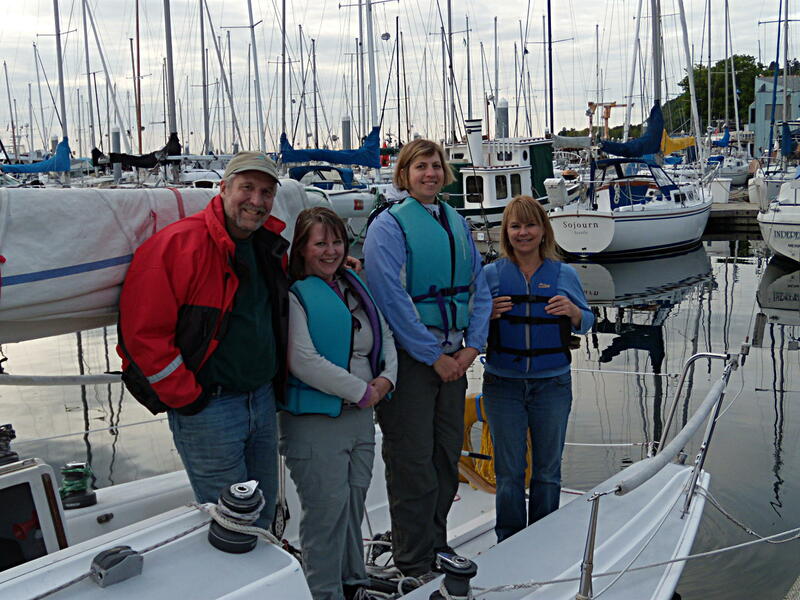 Spent quite a bit of time going over sailing and boating basics. A nice evening sail, light wind, close-up view of the Laser racing fleet at the mark rounding. Nice picnic, food and good company. Got a up close view of a freighter and a while later a real roller coaster ride on the freighter wake, Epiphany sailed by with a fender down to entertain the crew. 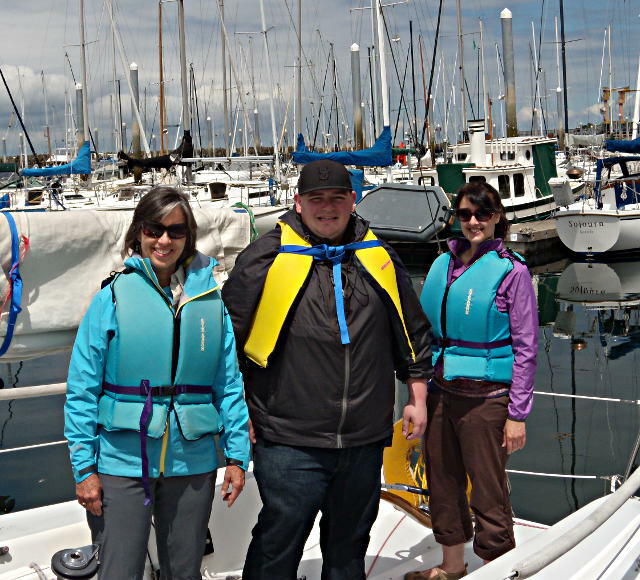 Marcus got to practice his sail trim skills from his sailing class. 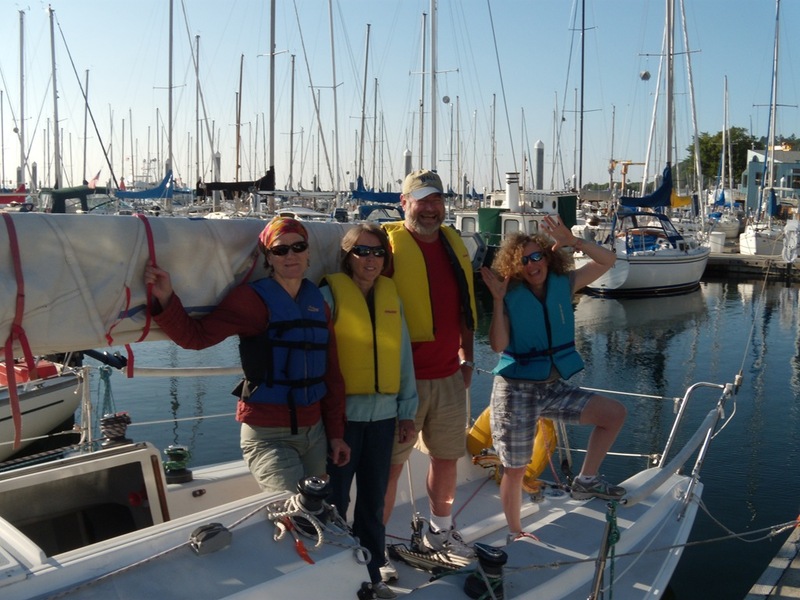 Nice evening sail off Shilshole in Seattle with a potluck at the dock with great conversation, nice sunset. Could not resist putting in the funny face thing. 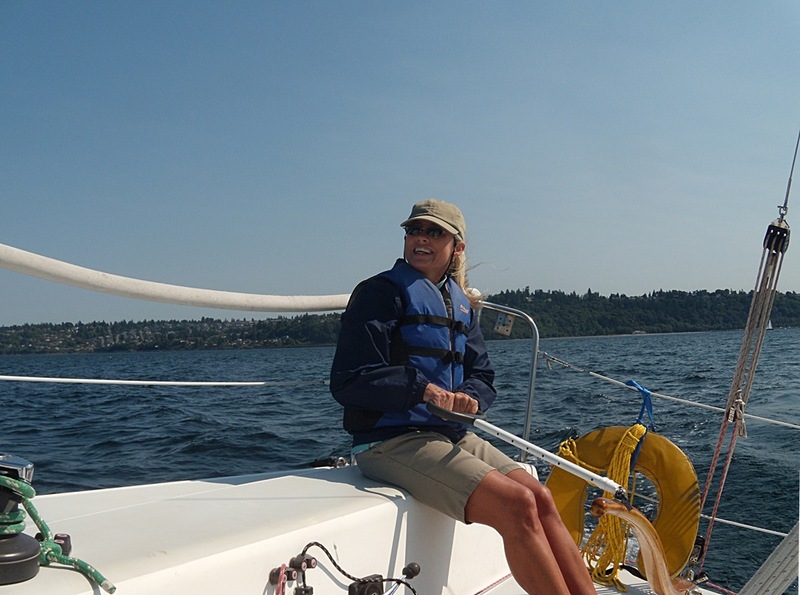 Jill in command having fun sailing in Seattle- First time on a sailboat – first time driving – note the smile. 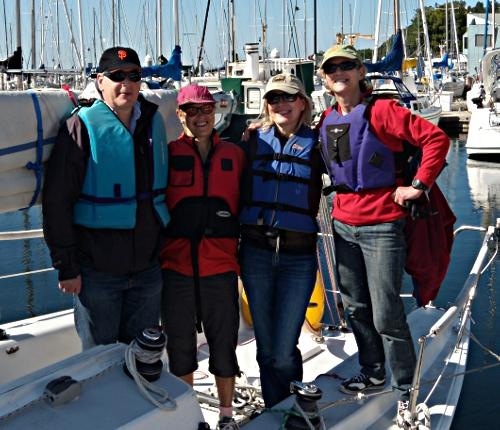 This was Jill’s first time on a sail boat. She wanted to learn how to sail. 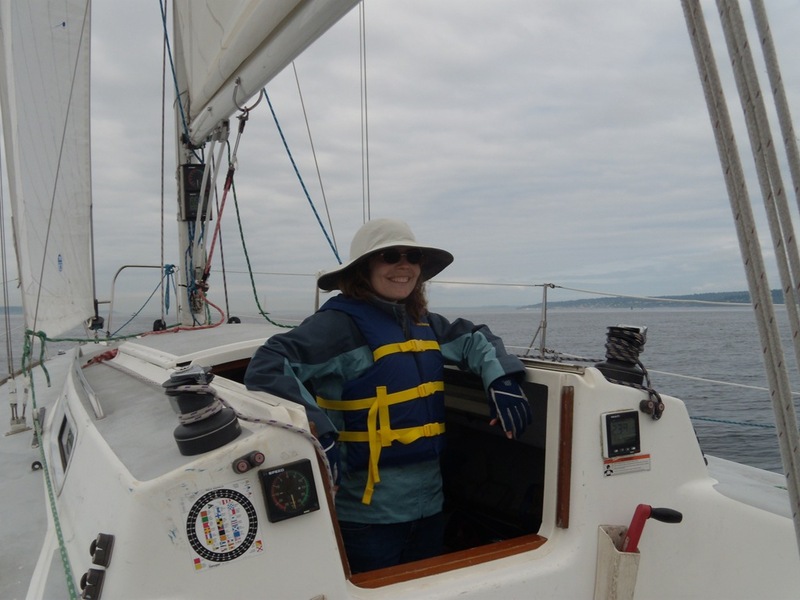 She had studied the Basic Keelboat book but even that book is intimidating to people that have not been on a boat. So we did the “immersion” method of just start driving and doing the other jobs. Jill caught on quick and did a good job – but a bit of information overload and she was a bit tense at times – but did a good job. Nice medium wind – wind was a up a bit at the start so we left the reef in from Sunday. The wind eased but left the reef in – turned out to be a good decision when a couple of the jibes were a bit rough and the boom came round in a hurry. Everyone had a chance to do every job. The sun was out for the start of the trip – the rain came at the end. Nice sunset when it was raining. Nice wind, a Friday night group was out racing, bit of a challenge getting through the obstacle course, but some nice views of the other boats. The other boats had better sense and were in the bar by the time the rain came. Wind started light then got lighter. Bit of a picnic while waiting for the wind to clock around and fill in. Everybody got to do every job. Did manage to get one picture of each person smiling and not growling at my camera. Walked past a few other boats with way more waterline in the light stuff, and Nanook was out with the Fender Offender Shot. Thanks Nanook for entertaining the crew. 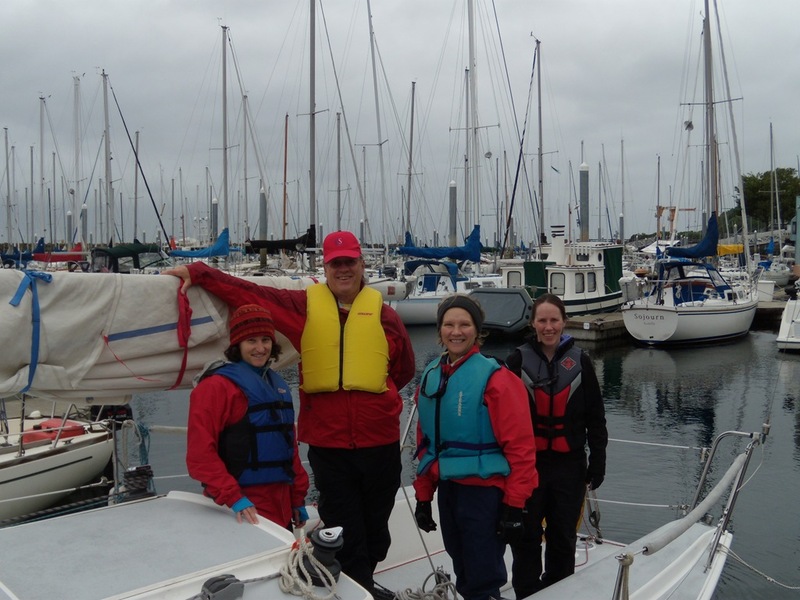 Nice crew – started with a reefed main but the wind did not fill in like the forecast so we took the reef out and things worked better. CYC had their Wed night race going on and then there were several boats that looked like they were practicing for this weekend’s Regatta. Bit of a lump but not too bad. Did a bunch of tacks and jibes. Nice food and company after we got back to the dock. Bit wind and a bit of lump. Good crew. 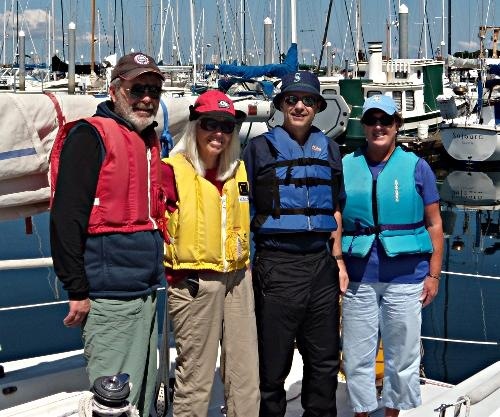 Went north – found an extra PATON (Private Aid to Navigation) so we got the Lat / Lon of the extra buoy – double checked the light list and the PMEL buoy was not in the system so called in a discrepancy to the CG. 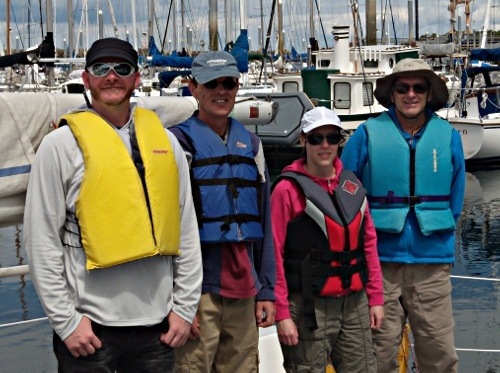 Deputized the crew and made them Special Navigation Systems Deputies for their help. A bit of GPS practice for some of the crew also. 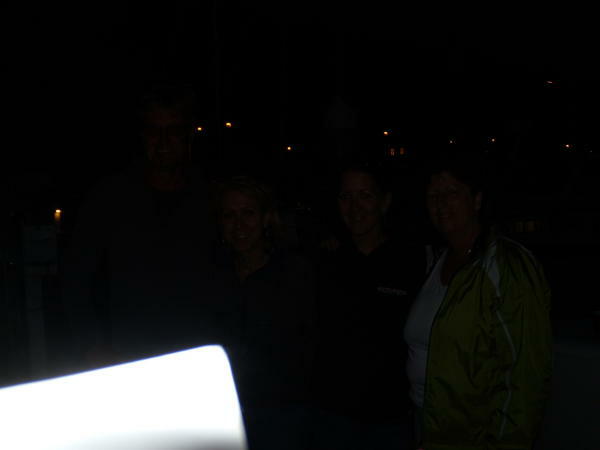 Sorry Patrick about only having the back of your head in the picture. Also checked the position of the Richmond Beach Research Buoy – it was where it was supposed to be. Nice wind (well part of the day) sunny – nice trip up to Richmond Beach. 15 – 18 knots of wind – bit lumpy but not too bad – up close with the Victoria Clipper and a container ship. A nice time was had by all. A quick trip down to Blake Island and lunch on the boat. 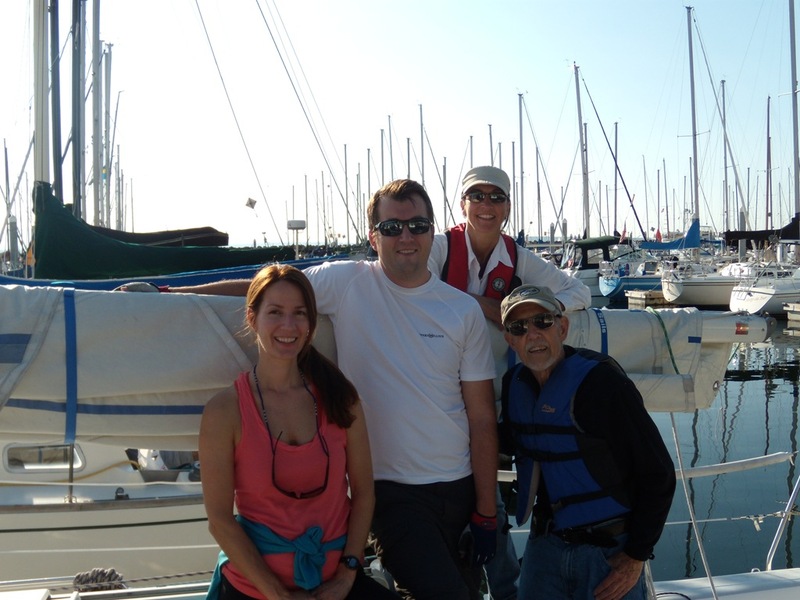 Nice group and good weather – warm in May !